when i crafted my catch up by photo dump post i didn’t give much – or any – detail about my dad’s leg surgery. so i’m gonna fill in a few of the blanks. my dad was out enjoying his last morning in chiang mai, visiting the market, just taking it easy and minding his own business. 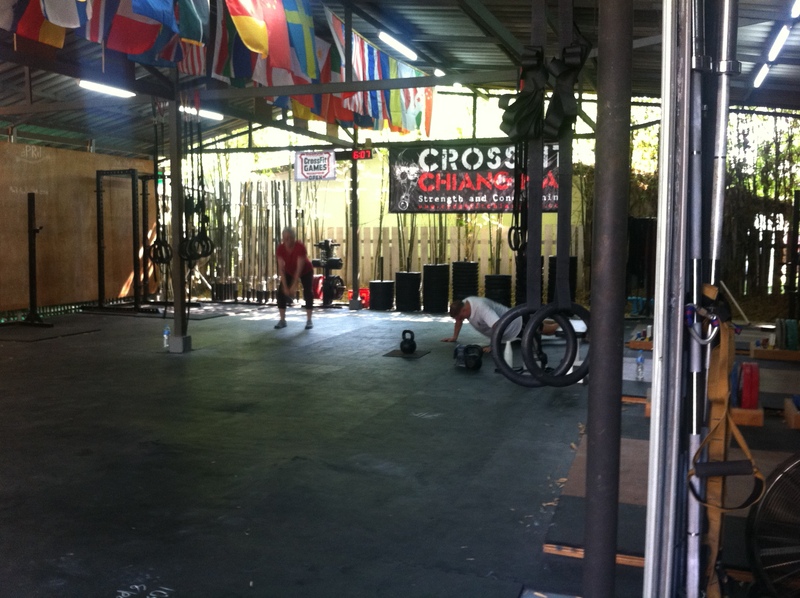 my mom had stayed behind to do a little packing and wait for me to get back from working out. 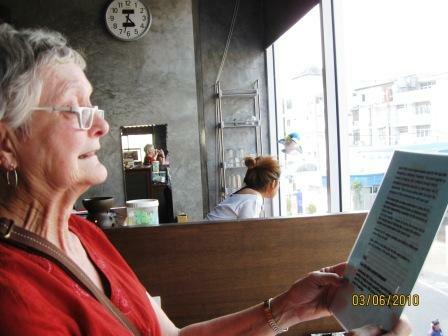 once i got home the two of us headed out to grab a cup of coffee (or iced chocolate for her) and do a little reading, but before we could get into the coffee shop my mom got a call from my dad. 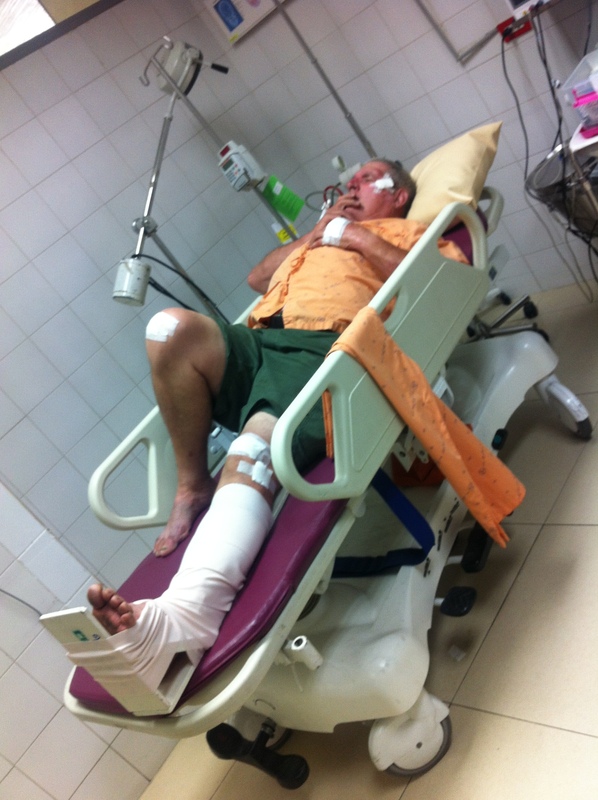 he was in the emergency room at maharaj nakorn chiang mai hospital. he’d been hit by a car. did i mention he was out and about taking it easy and minding his own business on a motorbike? (a slightly sketchy motorbike at that.) he told us he was certain his leg was broken. my mom and i headed over to the hospital and after finding a parking spot – no small feat – we located the er and then located my dad. he was right about his leg. he had a spiral fracture of the tibia. it was his left leg – he has a history of injuries on that leg. the orthopaedic resident informed us that surgery was necessary, but that it would take a week or two for them to get around to operating at this hospital. this is a public hospital and the worst cases get seen first. the resident suggested we move my dad to a private hospital. thanks to some quick replies from friends here in chiang mai we were able to connect with an orthopaedic surgeon and get my dad moved to ram hospital just a few minutes down the road from maharaj nakorn chiang mai hospital. we eventually met with the orthopaedic surgeon. he was hoping to operate that night, but because of my dad’s prior injury and some blood clotting issues in that leg he needed to consult an internal medicine doctor first. my mom and i left our phone numbers at the nurses station and headed home so she could take care of cancelling their flight home, check with traveler’s insurance requirements, and find out the date their visa’s expired. it was 7:30 or so when we made it back to the hospital and my dad was in surgery – they’d wheeled him on down to the internal medicine doctor so she could give her yay or nay. the surgeon came out to speak to us about 10. he said the surgery had gone well and that my dad should be out of recovery in a few hours. he answered my mom’s questions and then we waited for my dad to be rolled out of recovery. they rolled my dad out about midnight and we all headed up to his hospital room. we made sure he was situated and we headed home for some sleep. i was a little alarmed that they hadn’t put a cast on his leg and that they had no intention of casting it at all, but i’ve been told that’s they way the do it now. my dad was out of the hospital on saturday and they began figuring out when they could go home. due to some constraints from their traveler’s insurance they needed to fly sooner rather than later and managed to book a flight that wednesday (or maybe it was thursday). my dad went to see his doctor this week. i haven’t heard how that appointment went, but i’m assuming no news is good news on that front. 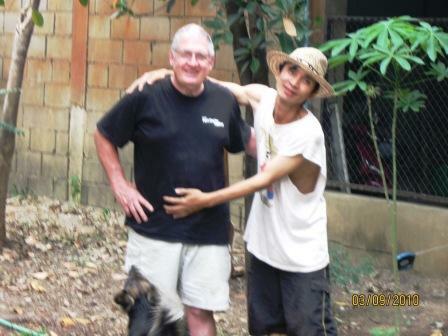 this is my dad and p’khao. p’khao thinks anything my dad does or is gonna do is brilliant. and he also thinks that my dad will surely need his help. it’s cross-cultural male bonding. don’t they look bonded? 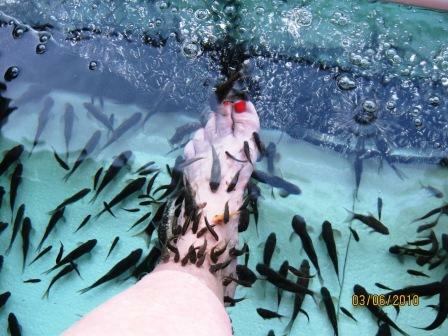 here’s a photo of my mom partaking of the fish spa. that’s sheer joy on her face. and the fish partaking of my mom. but the international day post i wrote got lost. so i’ll give you the highlights, if they don’t make sense it’s wordpresses fault. we saw no gibbons. not one. but if we had, i don’t think they could possibly have flown as well as we did. we were awesome. started out bright and early. we met the bus at 6:30am for our one hour drive up really steep and really windy and really bumpy roads. we sat in the very, very, very back of the bus. and bounced and winded and rocked and swayed until a12 said, “i think i’m going to be sick.” and she was. and maybe two milliseconds later the driver said, “we’re here.” and we were. first job – signing waivers. then we were off to get harnessed up. then a quick trip by van (a few of us started turning green at the mention of getting back in the van) and we were ready to go. we had an introductory talk/safety lecture from one of the spotters. the only one who’s name i cannot remember. one of the things he explained to us was the brake system for zip lines. it’s very, um, low tech. but it did seem to work, when we could actually remember to use it. and then we were ready for our first zip line. i have to do a little bragging on my kids here – they deserve it. we’d spent quite a bit of time talking to and at the kids about how expensive this little outing is and how very, very nice it was of grandad and nanny to pay for it and how once we signed up and paid the money there would be no. backing. out. and i fully expected to have to push at least one kid off a platform. maybe all the platforms. but other than a few nervous jitters and the initial “i don’t want to go first, you do it, so we can see if you survive” moment they were totally psyched and all systems go! not one time did anyone mention being scared or not wanting to go or even needing a few moments to gather their strength. nope, they were amazing! as we progressed through the ziplines they held onto their harnesses much, much looser and their smiles became much, much broader. after the first zip line s9 became adamant that he go first. always. he finally acquiesced to letting the spotter go ahead of him. but he really did not want to. next was the first sky bridge. i’ve got no problem admitting it was a little bit unsettling. i might have been the only one who felt that way, but i didn’t let it show! then we really started flying – the confidence was building so the whole gripping the harness thing became unnecessary. a few times we were lowered from one platform to another so we could continue our journey. and we even zipped in tandem once. but since there are 5 of us, one had to go it alone. a12 & s9 applying their brakes. c15 & i almost mastered the brakes, almost. it ended well before we wanted it to be over, but we were ready to get out of those harnesses. two hours is along time to be so bound up. we took many, many more pictures. if you want to see them head on over to my flickr page. this little doze may or may not have occured mid-conversation. it would be unfair of me to not mention the pain killers he was taking or the many projects he completed post clavical break that could have contributed to his weary condition.